This is a play by play of the previously posted story mode. I remember playing Scotland Yard a lot when I was younger. It was probably one of the first games I played that had a cooperative aspect. I like being able to talk out my moves and get advice. 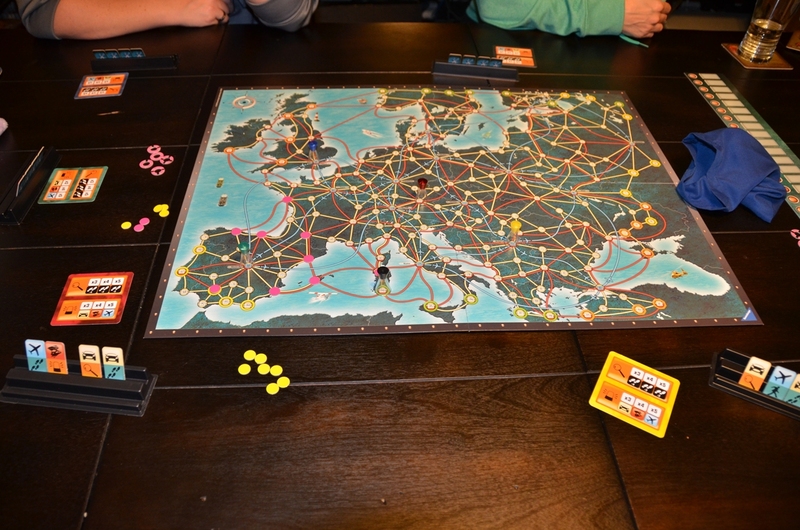 Mister X is very similar to Scotland Yard – one player is the criminal while the rest are detectives trying to catch him, and tokens are used to make moves. When we first started playing Mister X, President Gamer volunteered to be Mister X. This meant his wife was one of the detectives. Other than the one time The Professor has been Mister X, this is how we played the game, probably because President Gamer was determined to outsmart his wife and win the game! 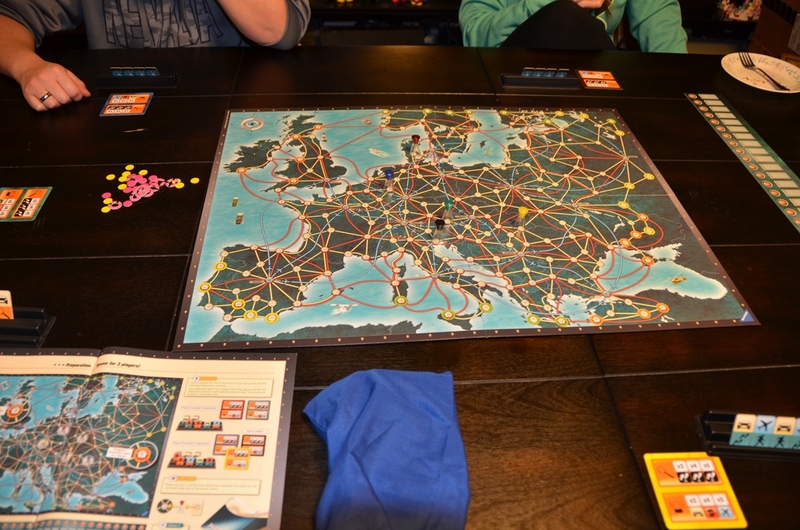 President Gamer was Mister X and decided on the yellow mission (advanced players). The rest of the group started fairly close to the yellow starting spaces (140, 167, 169, 193, and 194) which definitely gave us an advantage. We utilized the pink and yellow markers and closed in on Spain. 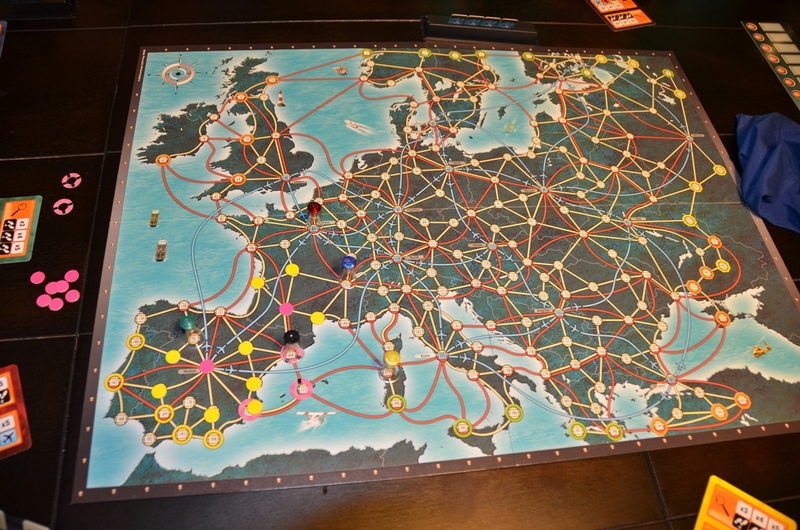 Since Mister X used two secret moves and two double moves, it was important that we move quickly. We used sirens to find out his location for move 3 at 191, and then Shutter crossed his path on 173 (move 4) and 164 (move 5). And on his next move The Professor caught President Gamer at 106, eight moves into the game. That’s what happens when you’re a criminal and your wife is a detective! Mister X feels like a well balanced game. The detectives have some advantages other than numbers. The tokens used to mark potential locations are very helpful (until you run out or forget what you used them for). The sirens (to reveal where Mister X has been) and magnifying glasses (giving a detective a second move) are also very useful. However, Mister X has the benefit of making a secret move (not revealing what transportation he took) or making a double move. Because he draws twice as many tokens than the detectives, he is able to make these special moves more often than the detectives get to use the sirens and glasses. This will likely continue to be a favorite, if only to see how quickly Shutter figures out where President Gamer is.